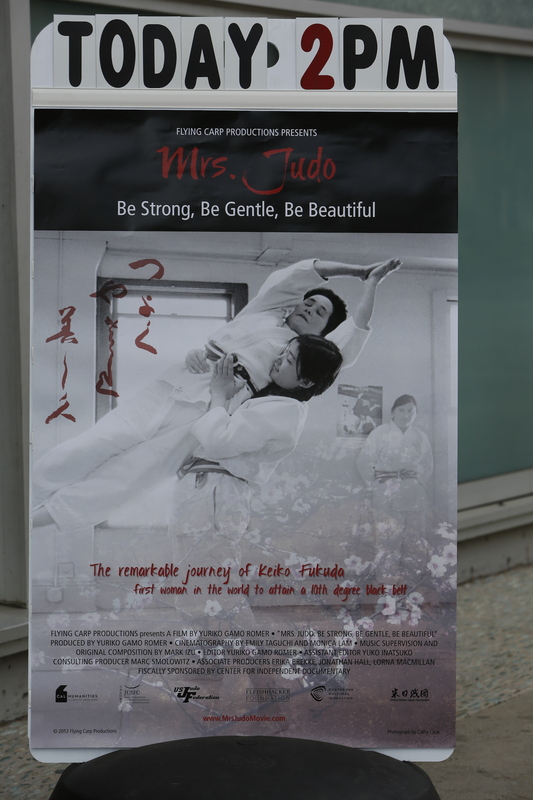 On November 16, 2013 the Los Angeles premiere of Mrs. Judo: Be Strong, Be Gentle, Be Beautiful was held at JANM. Mrs. Judo is a documentary by Yuriko Gamo Romer, that captures the late Keiko Fukuda as she reflects on her life and the choice she made to defy thousands of years of tradition, follow her own path, and ultimately become judo history’s only woman to attain the pinnacle 10th degree. A live demonstration of “Ju-no-kata”, a signature form of Fukuda-Sensei, preceded the film screening. The program opened with a live demonstration of “Ju-no-kata,” Fukuda’s signature form, by Charmaine Galvez & Robin Fernandez of Jundokai Judo and Jujitsu Club of La Mirada. Ju-no-kata is designed to teach the fundamental principles of judo, especially the principle of ju (yielding or gentleness). It consists of three sets of techniques and is performed by a pair of people, one acting as an uke (the person who “receives” an attack) and the other a tori (the executor of a technique). The panel was made up of Yuriko Gamo Romer, Hal Sharp, Kenji Osugi, and Robin Fernandez. 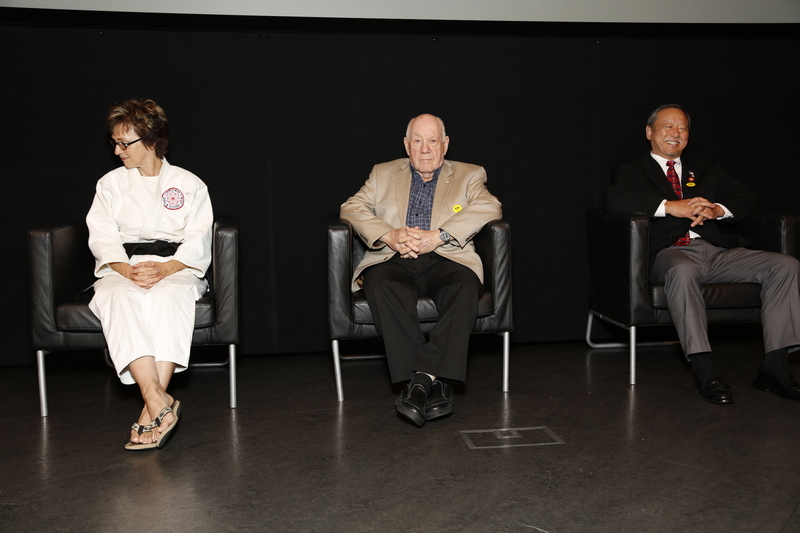 Following the screening of the film, director Yuriko Gamo Romer, judo demonstrator Robin Fernandez, Hal Sharp of Gardena Judo Club, and Kenji Osugi of Sawtelle Judo Dojo discussed the cultural traditions and relations that continue from Japan to the U.S. through judo. When it was time for the Q&A session, many audience members expressed positive feedback, and thanked the director for the wonderful documentary. 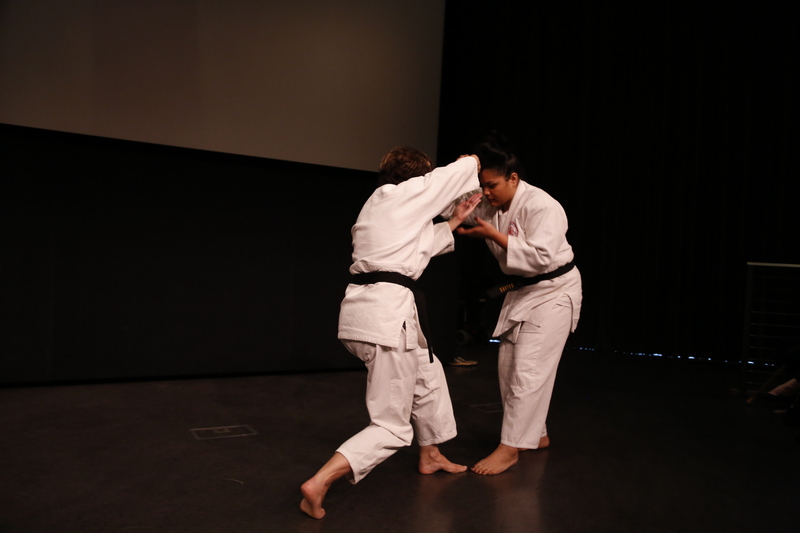 Check out these photos from the Mrs. Judo Screening! Community Outreach Coordinator, Jill Shiraki, welcomes guests to the screening. Ju-no-kata is designed to teach the fundamental principles of judo, especially the principle of ju (yielding or gentleness). Robin Fernandez and Charmaine Galvez perform ju-no-kata with narration by Greg Fernandez of Jundokai Judo and Jujitsu Club of La Mirada. Mrs. Robin Fernandez is associated with the La Mirada Jundokai Judo and Jujitsu Club. She is a 4th degree black belt and has been practicing Judo for 28 years. Mr. Hal Sharp is associated with the Gardena Judo Club. While serving in the U.S. Army and stationed in Occupied Japan, he became intrigued by the rigorous judo training at the Kodokan headquarters in Tokyo. Mr. Kenji Osugi carries on the legacy of the Sawtelle Judo Dojo that was founded in 1927 and remains one of the oldest judo schools in the United States. Sensei Gary Goltz, presents an award to director, Yuriko Gamo Romer, and the late Keiko Fukuda’s housemate and gym partner, Shelley Fernandez.